I finally had a day off of work, which meant I could finally cook for me! After spending the day cooped up doing homework because of the blowing snow outside, I decided to make a semi-fancy dinner for myself as a reward for all of my hard work. =) This dish is plated kind of similar to the Cajun Salmon w/ Spicy Eggplant Salsa that I made a little while back, but has extremely different flavors. So, if that dish didn’t suit your taste, this one just might! I have to say this might be one of the better things that I have tasted in a bit. 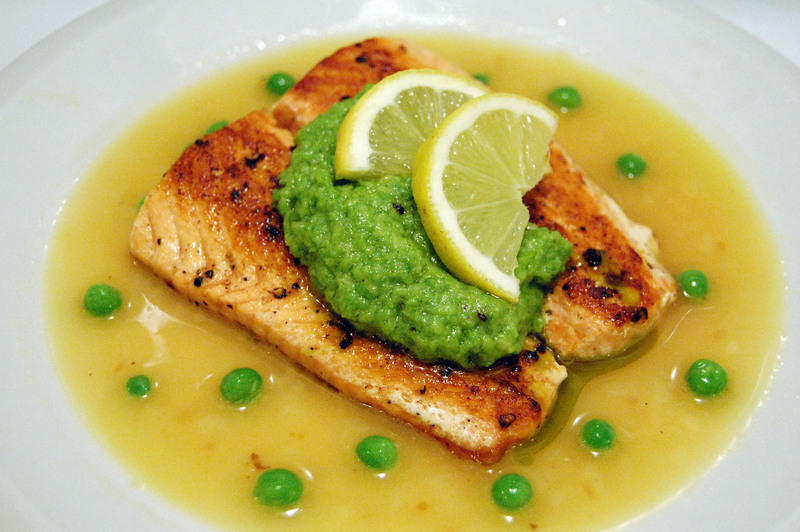 The Lemon Brodetto gives the salmon a nice citrus kick and the pea puree tones it down with a rich flavor. I tweaked the original recipe, from FoodNetwork.com, and lowered the measurements for lemon juice. The lemon was just a tiny bit too strong with the original portions. I love how much flavor there is in this dish, plus it is super easy to make! For the Lemon Brodetto, warm the olive oil in a saucepan over medium heat, then saute the shallots until tender (about 5 minutes). Add the lemon juice, zest, and broth. Bring to a simmer, cover, then keep warm over low heat. For the Pea Puree, combine the peas, parmesan cheese, garlic, salt and pepper in a food processor and puree. With the machine still running, slowly add the olive oil to the puree. Set aside and keep warm. For the salmon, warm the olive oil in a large skillet over medium-high heat and season the salmon with salt and pepper. Sear the salmon until a golden crust forms on each side and it is cooked through (about 3-5 minutes per side). To assemble the dish, add the mint to the Brodetto, if you are using it, and divide the mixture between 4 shallow dishes. 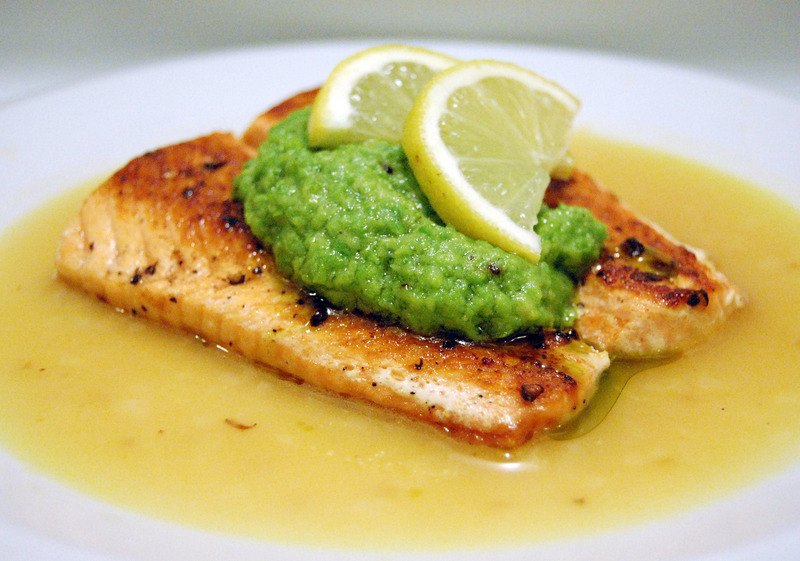 Place one filet of salmon in each dish, then spoon a large spoonful of Pea Puree onto each. Also optional, sprinkle cooked green peas throughout the Brodetto and serve. The pictures are so amazing.. Dish looks just perfect 🙂 really nice recipe, I especially like that pea puree. Thank you! I love green peas, so I was really excited on how that turned out. This looks really wonderful.I hope you could add this salmon widget at the end of this post so we could add you in our list of food bloggers who blogged about salmon,Thanks! Wow – what a gorgeous piture! That looks incredible. My husband would LOVE this dish…and his birthday is coming up. Thanks for the inspiration! Thanks! Perfect, it is soo delicious I’m sure he will love it!